Posh centre-back Alex Davey has recovered from illness and will play at Southend. Peterborough United manager Dave Robertson is adamant his side will deliver a much-improved display in front of the live TV cameras at Southend tomorrow (September 5. 12.05pm kick off). Robertson hosted a heart-to-heart with his first-team squad following Tuesday’s (September 1) disappointing Johnstone’s Paint Trophy defeat at Millwall. As a result he’s confident errors made in that match will not be repeated in tomorrow’s League One clash at Roots Hall. Posh have lost every away match this season, but Southend have yet to win a competitive game. Robertson said: “I was angry, frustrated and disappointed with the manner of our defeat at Millwall, but we sat the squad down the following day and pointed out to them where they had gone wrong. “On the ball we have delivered some excellent passages of play, particularly from Marcus Maddison, but our wide players didn’t work as hard as they should have at Millwall and they now know that. “It’s often about working hard for the team and not just for themselves. There was a lack of discipline late in the game that disappointed me. “But that’s behind us now. We’ve worked on the points we discussed and I do not expect to see the same mistakes again at Southend. “It’s an important game for us at Southend. We watched them live at Doncaster and we have watched a dvd of their draw at Coventry this week. “They have good players, The front two, Mooney and Hunt, are a threat, but they have good players out wide as well. “We have come up with a gameplan to combat them and if we play with discipline and quality it’s a game we can win. We’ve told the players that the harder they work the luckier they will get. Right-back Michael Smith is expected to start a match for the first time this season after recovering from a back injury. Central defenders Ricardo Santos and Alex Davey should start again despite being forced off by injury and illness respectively at Millwall. Left-back Kgosi Ntlhe could return to the squad after his mystery toe injury cleared up. 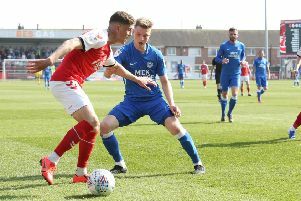 Midfielder Jack Collison is definitely back after sitting out the Millwall match, but newcomer Chris Forrester has a good chance of keeping his place in central midfield, possibly alongside Michael Bostwick. Robertson will also try and find a striking permutation that works. He will select two from Conor Washington, Kyle Vassell, Souleymane Coulibaly, Joe Gormley and Lee Angol. Robertson added: “I have five strikers to choose from and it’s time for the ones I do pick to start scoring goals for us. It’s what they are paid to do and they need to start doing it. Michael Smith is a top professional so it’s great to have him back and it’s the same with Jack Collison. Jack is a good passer of the ball and he can also manage those playing around him. “I felt Chris Forrester enjoyed an excellent debut. He showed his quality on the ball and he showed us his energy and ability to get forward in support of his team-mates. Midfielder Jermaine Anderson (England Under 20s) and Gaby Zakuani (DR Congo) miss the match because of international call-ups.